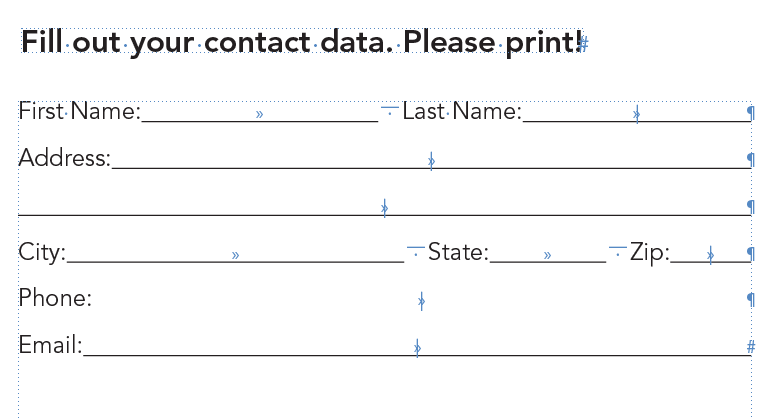 I’m not talking about PDF forms here — something InDesign CS6 does just fine on it’s own, thank you very much.. No, I’m talking about good ol’ “‘print your name and address here” forms on regular real life paper. I’ve seen several hundred different ways to go about this, with everything from lines drawn with the line tool, to using an insane amount of underscores, etc. Here’s the thing. It’s actually super simple. They key is to use tabs and underlines. Here’s the same form with hidden characters shown. For those of you unfamiliar with any of these hidden characters, we’re using tabs, right-indent tabs, em spaces and underlines. On the first line, type “First Name,” insert a tab, then an em space, then type “Last Name” and then insert a right-indent tab. Type in the other lines. Tabs are used between items, an em space is used to add some padding, and right-indent tabs are used everywhere else. Select the tab after “First Name” — you will see that the whole “empty” space will be selected — and then apply an underline. Select the right-indent tab after “Last Name” and apply an underline. Repeat. Is flexible. Right-indent tab will expand or contract as your text frame does.